Background: Ventral hernia repair with mesh is a frequently performed procedure and the Natural Orifice Translumenal Endoscopic Surgery (NOTES) concept might be adaptable for hernia repairs avoiding incision in the abdominal wall. The risk for infection in mesh placement is of concern. 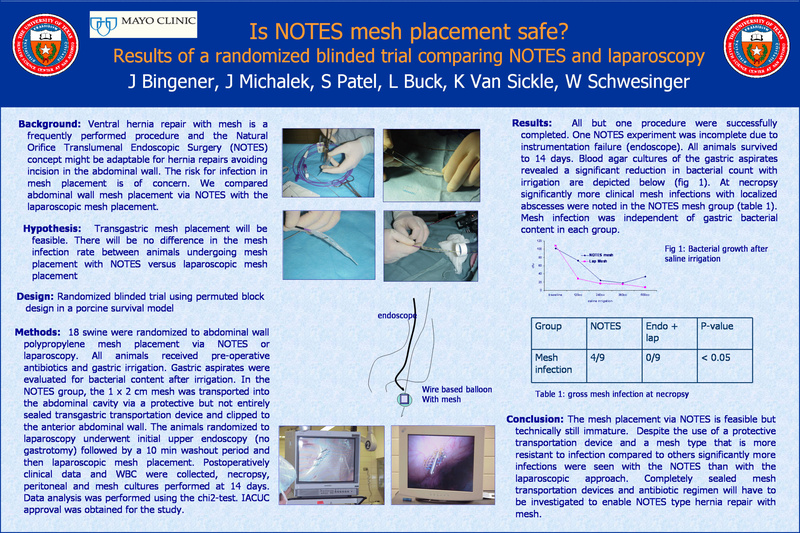 We compared abdominal wall mesh placement via NOTES with the laparoscopic mesh placement. Methods: 18 swine were randomized to abdominal wall polypropylene mesh placement via NOTES or laparoscopy. All animals received pre-operative antibiotics and gastric irrigation. In the NOTES group, the 1 x 2 cm mesh was transported into the abdominal cavity via a protective but not entirely sealed transgastric transportation device and clipped to the anterior abdominal wall. The animals randomized to laparoscopy underwent initial upper endoscopy (no gastrotomy) followed by a 10 min washout period and then laparoscopic mesh placement. Postoperatively clinical data and WBC were collected, necropsy, peritoneal and mesh cultures performed at 14 days. Data analysis was performed using the chi2-test. IACUC approval was obtained for the study.